Locally farm raised, 100% natural, fed non-GMO grain, no antibiotics, no hormones. 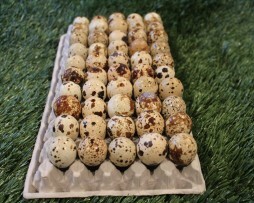 Our quail eggs come from our Jumbo Brown Japanese Quail that receive adequate space, nutritious food, clean water, proper lighting and fresh air every day. Hatching Eggs are available for local pick-up and shipping. Shipping will be calculated based on zip code. Coturnix (also called Japanese) quail are an excellent and inexpensive way to add an egg and meat production source for your family. Young Coturnix Quail can be used for Dog Training as well! Sorry, we do not ship our adult birds, local pick up only! 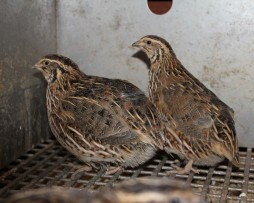 Looking for Jumbo Brown Japanese Quail Chicks for sale? 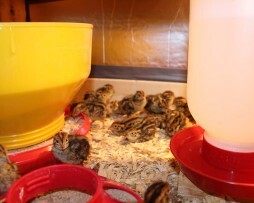 Jumbo Brown Coturnix Quail for sale! Coturnix (also called Japanese) quail are an excellent and inexpensive way to add eggs and meat production source for your family. We have both eggs and quail for sale on an ongoing basis late April through September. NOTE: For shipping, minimum order is 50 chicks. Shipping now, Please select your preferred date in the options dropdown.